For pity’s sake what is all rush of letters about? Almost look as if you were working up for another long lay off. Still – despite the consequences thanks a lot. The news does not sound as if it is going to be so hot at Park Royal once the big shift gets under way. air every day. The only bother is they won’t wheel out a pass so that I can hike for the hills. We were due for leave but it has been scrubbed for some bloody reason. Nobody knows and nobody cares except the poor blasted air crews. of the eyes quite a [deleted] nub [/deleted] number could have been called drunk. I know why they make us keep fit now. If we weren’t we could never last through our rest periods. “keep ‘em flying” I shall have the greatest pleasure in taking them apart to find out what makes them tick. Other news is taboo – or the interesting news is. will I smile – or will I? There is not a lot to write about and if my letters are getting shorter it is because I can’t sit down for long these days. However I will – as usual – try and write once a week even if it only says I am brassed, which you should by now take for granted. My rest is up on Saturday so I shall try and write about Monday or so. 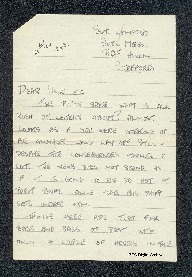 Peter Lamprey, “Letter from Peter Lamprey to W Gunton,” IBCC Digital Archive, accessed April 20, 2019, https://ibccdigitalarchive.lincoln.ac.uk/omeka/collections/document/6610.